Everyone at Fine Line Homes is as overwhelmed at the rest of Alberta to witness the unreal damage to our beautiful neighbourhoods and towns from last week’s floods. We would like to send our very best wishes to everyone out there who has been affected, and thanks to our rescue workers, police, firefighters, and especially the volunteers who have been working endless hours to put our province back together. We are very proud to be Albertan! Doors mean a lot. They greet guests, but also and the uninvited out. They are meant to welcome, but also provide a sturdy barrier when needed. They should be attractive, but durable. Doors are representative of all the simple truths, perhaps most of all in places like Okotoks, Calgary and area – where Fine Line Homes builds and operates – and where there’s never a happy medium when it comes to weather. At Fine Line we always emphasize the need for quality exterior doors – not only for security, but for savings. In any average home a great deal of energy escapes through drafty doorways, leading to inflated energy bills and a lot of wasted resources. In Alberta, those costs add up quickly. Fine Line Homes’ projects are all designed to be energy efficient across a comprehensive range of platforms. There are now several choices for excellent storm doors that are both beautiful and practical, and work perfectly with our systems. Not so long ago it seemed unreasonable and frivolous to have an exterior door with a window in it in Calgary. Now, it’s not so strange, and some of those windows even open! Gone are the days of the screen door PLUS the ugly slab of your storm door. The new designs for doors are more functional and better at conserving energy. Glazing. Everything should be double-or triple-glazed, and be sealed within a fully insulated glass unit. Glass. Low emissivity or “low-e” glass reflects more sunlight, which in turn prevents glare from entering your home and causing it to try to cool off. Conductivity. 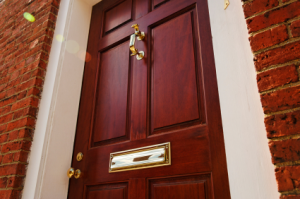 Reducing heat conductivity is one of the keys to building an energy-efficient door. Good doors have spacer bars that create warm edges, which in turn help control thermal transfer. Inert gas. Doors are scientific! Argon or krypton gas is often used within the sealed unit of an energy-efficient exterior door. Insulation. Energy-efficient exterior doors have insulated door cores, sashes and frames to reduce heating losses during the winter, and prevent external heat from penetrating your home during the summer months. Sealing. Completely airtight. All energy-efficient homes eliminate as many sources of air leakage as possible. Doors can also reduce noise while collecting less condensation, which helps maintain optimal indoor humidity levels and prevent the hazards posed by excessive levels of indoor moisture. A door can be environmentally friendly because it’s energy-efficient, and also because it’s recyclable and sustainable. Because of its attraction, versatility and practicality, wood remains a popular choice, and all of our wooden exterior doors are sourced from respected manufacturers. Steel and fiberglass are options, as well, and come in a variety of shapes and sizes. Both can be broken down, saved and reused after use, and can be molded and painted to match any exterior and fit in to any landscape. There are a number of amazing door designs available, and you can always feel free to make your own, too! Fine Line Homes operates in Calgary, Okotoks, Springbank and area, and we take great pride in providing our customers with premium quality energy-efficient homes with custom designs. We’re happy to work with you to guide your selection of doors, windows, and other energy-saving home accessories. If you have any questions, or if you would like to learn more about the many benefits of our homes, please don’t hesitate to contact us.